This weekend, celebrate setting your clocks forward an hou….zzzzzZZZZzzzz….What? Huh? I’m awake! Anyway, as I was saying, the return of daylight savings time means that—current storms not withstanding—summer is almost here! With summer comes long, lazy evenings, perfect for roller skating Vancouver’s seawall. So, get yourself to Raw Meat Roller Skating this weekend, to learn to roller skate so you are ready to skate outside when the sun finally comes back. 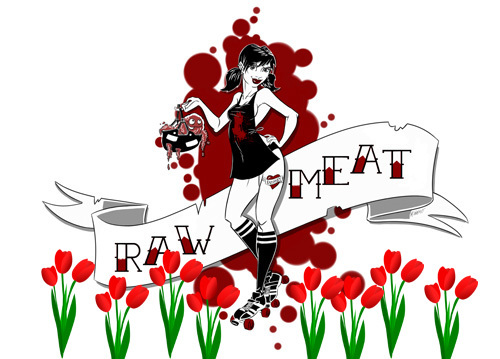 At Raw Meat, you’ll learn roller-derby style roller skating in a fun, non-contact atmosphere. You’ll learn all the skills you need to try out for a roller derby league (the local leagues have tryouts in the fall), which also happen to be the skills you need to safely skate outside. No matter your skating goal, you’ll learn what you need at Raw Meat. To skate at Raw Meat, you’ll need roller skates, a mouth guard, a helmet, and wrist, elbow and knee pads. Your toe stops should be white or light-coloured, and please put white tape over black knee pads, to avoid marking the floors. From March 12 to April 9, Raw Meat will meet every Saturday from 5-7 PM at Thunderbird Community Centre, 2311 Cassiar St. Sessions at Thunderbird are $7. Starting on April 16, and running through the summer, Raw Meat will change time and venue. We’ll meet from 10 am to noon, at Royal City Curling Club, 75 East 6th Avenue in New Westminster. Sessions at RCCC are $12.